Maker Ed’s Young Makers program offers a blend of in-person and online workshops and training events. Check out a sampling and overview of one such event from the 2015 Young Makers season below and stay tuned for other professional development opportunities from Maker Ed. 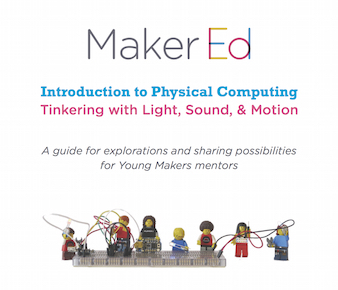 In March 2015, Maker Ed’s Young Makers program offered mentors a professional development experience on the subject of physical computing. In addition to Physical Computing concepts and content, the workshop and guide focused on facilitation approaches, ideas on working with youth of all ages, backgrounds, and skills, and on-site, hands-on experience with tools, materials, and peers. Check out a copy of the workshop guide to get you started and check out a blog recap of the event itself to a get a fuller sense of the experience. Physical Computing is an exciting and interactive connection between physical and digital worlds. In this workshop, you will gain comfort and experience with physical computing through the use of Trinkets, small and economical Arduino variants, and electronic prototyping. Join us, and tinker with basic electronic components. Peek inside and learn from simple projects and programming code examples, and tweak them to make your own. Practice soldering to create strong electrical connections. Collaborate to prototype and create original projects that dazzle (or frazzle) the senses and respond to the “real world” via light, sound and/or motion. In conjunction with Lighthouse Community Charter School, Maker Ed will host this awesome opportunity and participants may opt to receive 10 sets of materials to help support young makers in similar explorations and tinkering! Supplies and lunch will be provided, though we request that participants bring their own laptop.